Tomorrow Cubs position players must report to Fitch Park with the first full-squad official workout on Friday the 24th. February in Arizona is baseball weather, today we had a near perfect 75 degrees and sunshine. With 15 MLB teams all training within a one-hour drive of each other, the Valley of the Sun and the Cactus League have become the Mecca of spring training. 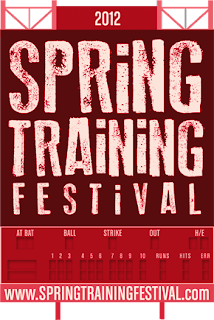 To celebrate spring baseball fever the City of Scottsdale is hosting a Spring Training Festival this coming weekend. The festival includes lots of food, live music, a feature called the Mad Science of Baseball, and Play Ball the Cactus League Experience. The festival is open from 10am to 6pm Saturday Feb. 25 and Noon to 5pm on Sunday Feb. 26 – Admission is free.